Good Graphs, Communicating Numbers Visually. I made the presentation using the Prezi website, and you can view it here. If you are attending a broad-topic meeting, many of your poster-viewing audience may not be familiar with your field. The introduction section of your poster may actually be the most interesting to them. A simple figure that introduces the viewer to your system can go miles towards keeping your viewer’s interest and helping them understand the context of your experimental question. I made this figure to introduce the concept of cytoadherence of blood cells during cerebral malaria for a student working in the Aliberti Lab. During cerebral malaria, infected blood cells start to adhere to the endothelial cells lining blood vessels in the brain. This disrupts normal blood flow and can lead to death of the patient. A simple figure like this costs $30 and adds life to your poster. Here is how the whole poster came out: I reformatted the poster, including drawing the mosquito, blood vessel, and methods diagrams, as well as in-depth reformatting of all 8 graphs for $130. I was working on a protein diagram today, trying to come up with shapes for the different domains. I found myself thinking back to the fun game, perfection. It's a great a source of shape ideas for your next diagram. Terrible Data Visualization, aka, This Map is Crap. I have noticed a popular link on Social Media sites that leads to an interactive map. This map shows colorful circles over a world map. With link titles like, “One map sums up the damage caused by the anti-vaccination movement,”it gives the illusion that these explosive circles are the recent result of reduced vaccinations. This chart is not about vaccination. Vaccination rates are not pictured at all on this chart. This is a bad way to visualize data. The dots for 1 case are nearly the same size as the dots for 175. Even by sliding the slider through the years, you can’t see if the cases are increasing or not because the dot size is mis-leading. If the authors were more interested in isolated outbreaks than number cases, then it’s still a problem because there are dots for combined outbreaks, as explained below. Using the number of cases doesn’t take into account population in that region. The downloaded data is sloppy and doesn’t match the map. The list of sources is various news articles, including articles about the country as a whole, as well as local articles that talk about breakouts in a specific county. I believe that this is shown as a single dot in the center of the US, as if it was a single outbreak in Kansas. The whole-country CDC numbers no doubt include the numbers from local municipalities, so they should not BOTH be listed. The CDC and the WHO report that there were nearly 2,000 cases of Mumps in the US in 2009, and yet the interactive map shows 12 cases. Good data on disease incidence is easily available from the World Health Organization and within the US, the CDC. I don’t know why the authors would use data-mined local news reports when there government departments who professionally tabulate this data. I made my own chart to address the rates of vaccination and illness rates. I choose to use the US because I live here, and I choose the MMR vaccine because I think that Rubella, Measles, and Mumps are very serious diseases that should be eliminated. My mother contracted Rubella (German measles) while pregnant with my sister in the 1960’s, before the rubella vaccine was available. Beth Ann was born severely retarded, deaf, and nearly blind. This is an extremely serious disease that many young people haven’t even heard of. For my graph, I used data collected by the CDC and WHO. I took into account the changing population of US by presenting the data as cases per million Americans. You can see my raw data and detailed list of sources here . Click here to view a large PDF of this graph. Based on my own anecdotal experiences, I expected to see a sharp recent increase in unvaccinated toddlers, but I don’t see that. I was also amazed to see how serious the Mumps outbreaks in 2006 and 2009 were. It’s hard to see a strong correlation in this data between vaccination rates and disease prevalence, but it’s hard to know what type of correlation to expect. I would guess that there would be a time-delay in decreased vaccination and then later an increase in disease. How long of a delay? Another complication is possibility of a threshold effect, where the slightest change in vaccination could have a huge effect for disease. Who are these ~10% of unvaccinated kids? Are they vaccine objectors, or are they parents who haven’t bothered to vaccinate their kids yet because they forgot, or because of the cost? It would be really informative to see vaccination rates for adults as well. This data is for kids who are past-due for their MMR vaccine, but do they eventually get vaccinated? I wish I had data for a longer time span. Small geographic areas of high non-vaccination could have a huge impact on disease. 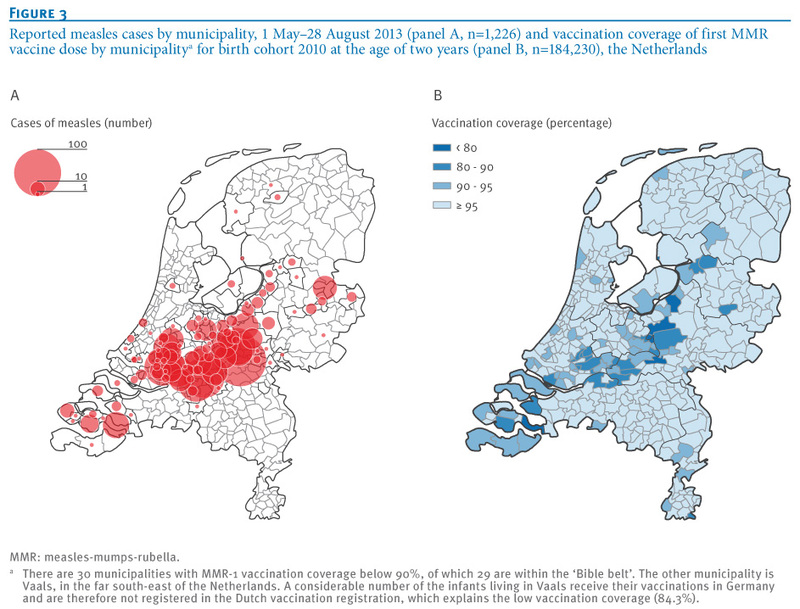 A friend sent me a link to this interesting peer-reviewed map made using highly localized data on both disease and vaccination in the Netherlands. I like this figure because it appears to be carefully and accurately drawn, with each circle representing an individual outbreak. I made an educational Video about PCR using the paper tactile model I designed in 2009. To the best of my knowledge, this is the only hands-on PCR learning tool around, so I decided to make a video showing how to use it. The novel concept behind the paper model is that the primer has a string hanging off the 3' end, and the dNTPs are beads. So, to start making a strand of DNA, you need to start with a primer (because it has the string). DNA replication also has to start with a primer. Watch the video if you want to learn more about it. I taped the video in my living room using a webcam and a headset microphone. I edited the video in Adobe Premiere. Finding music for your videos is real challenge these days. I chose fan-recorded music from a live Grateful Dead concert, because it’s my understanding is that the Grateful Dead allows people to use that. You Tube puts ads over your video if you use regular music, and I didn’t think that ads coving the video was in the spirit of a free educational tool. I recently received a welding helmet as a gift and I decided to make sure people would know it was mine by painting it with Posca paint markers. Thus far I have not done any type of clear coating over it. If you scrape the paint with your finger nail you can remove it, so a shellac might be required for long term preservation. I am going to try it out as-is and see how it wears. Consider giving your holiday mix a warm-up with these Christmas songs that you aren't tired of. I heard many of these for the first time on the Root Music Project Radio Program. How to calculate the area of an object and length of a path in Adobe Illustrator using Scripts. I have needed to calculate the area of a shape in order to determine the acreage of a perspective property plot, and to measure the length of a pen-tool-traced transgenic seedling root. Measuring area, perimeter, and length is not built into Illustrator, but there is an easy work around. This technique should work for all recent (perhaps all) versions of Adobe Illustrator. Telegraphics makes a nice plug-in for finding area and lengthlength in Illustrator, but it doesn’t work for the lastest versions: Adobe Illustrator CS6 nor Adobe Illustrator CC. The technique I will describe here is just as easy to use, and more universal. Step 1: Either download this file, or make one yourself. Step 2: Open your file in Illustrator and select the path or object that you want to measure. Step 3: Click on “FILE” and scroll down to ‘scripts.’ Select “Other Script.” A file dialog window should open up. Find and select AreaLength.JS. A small window will pop up that states the area and length/perimeter in inches. Do you plan to use it often? Then you might want this script to appear on the quick menu within illustrator so that you don’t have to navigate through your files every time you use it. This script rounds the decimal points to 3. If you want more or less, you can open AreaLength.JS in notepad/text editor and change “toFixed(3)” to a different number. I would like to thank the Adobe community for the tips on rounding. Would you like to measure your paths in other units instead? Change the text in the file. You can change it other units too. The default would give you the units in px, and there are 72 px per inch. Thus, in the ‘inch’ unit script we take the length is divided by 72, and the area is divided by 5184, which is 72 squared. If you make a new script, I recommend testing it on a shape of known size. You can do this by selecting the rectangle tool, single clicking once on the canvas. A dialog will pop up. Type in “1 cm” for width and “1 cm” for height (for example). These steps work in any version of Adobe Photoshop. The interface looks very slightly different in different versions, but I think you will be able to follow this just fine. Step 2: On the lower side of the layers pallet, click on the small round button that looks like a black and white cookie (see photo below with arrow pointing to it). Can't see your layers pallet? Never fear, you can find all pallets under the menu at the top called "WINDOW." (It's in the same row as File, Edit, Image, Layer, Type, etc.) Look down the list under WINDOW and check Layers. Step 3: The black and white cookie button (formally known as the the "create new fill or adjustment layer" button) will open a list of options. Choose "solid color." Step 4: Pick a color. Click OK. Step 5: Your entire image is now just solid color. Don't panic. Again, look to your layers pallet and find the pull-down menu that currently says normal. This is the blending mode menu. Change it from "Normal" to "Color". Theory behind blending modes: Blending mode changes how the pixels on this layer will interact with the layers below. "Normal" means that they will just stack on top, thereby covering the layers below. Each of the other blending modes are different algorithms. For example, "darken" means only the dark pixels on this layer would show and the light pixels won't show. For this tutorial, you probably want to stick with "color." Step 6: Your image should be colorized now. In addition to saving as a JPEG or whatever format you want to use this image as, also save as a Photoshop file (.PSD) so that you can retain a record of how the colorizing was done, and also so that you can change the color later with ease. Whenever you open your PSD file, you will still see your color layer in the layers pallet above your black and white original image. You can always click off the 'eye' on the colorizing layer to see your grey-scale image below. Re-click it to turn the eye back on. It's easy to change the color later if you save the file as a PSD. Just double click on the colorful part of your colorizing layer and pick a new color. Click OK.